To see photographic examples of a term, click the camera next to it in the list of botanical terms. The vegetative parts of a grass plant are roots, stems, and leaves. The flowering (reproductive) part is the seedhead. Grass roots are fibrous. Size of the root system depends on genetic and environmental factors and on management. In general, grasses that are capable of producing the greatest top growth are also capable of producing the greatest root growth. The ratio of roots to tops by weight ranges from about 0.8 :1 to 1.5 :1 for most native grasses. Soil factors influencing root growth are moisture, temperature, structure, depth, fertility, and chemical reaction. Soil moisture, generally, has the greatest effect on root depth. In shallow soils, root systems are shallow; in moist, deep, well-developed soils, root systems are deep. Grasses differ widely in their ability to grow in saturated, poorly aerated soil. Excessive wetness inhibits root growth of most grasses except those adapted to marshes. Soil temperature affects the growth of grass roots. In general, native perennial grasses have active root growth in the fall until frost, very slow growth through winter, and active growth again in spring from about 10 to 15 days before green leaves appear until flowering. After flowering, growth slows down and stops during summer when soil temperatures are high. The amount and frequency of top-growth removal by grazing or mowing have a marked influence on root growth. 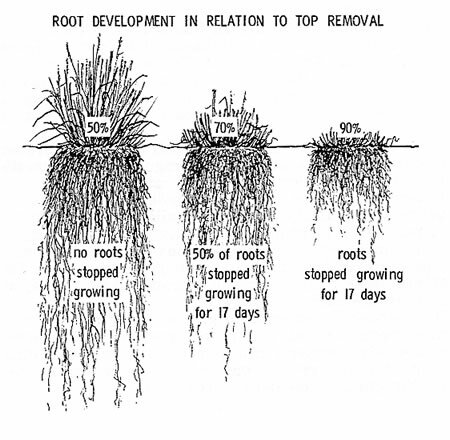 According to research (Crider, 1955), the proportion of roots that stop growing varies according to the proportion of top growth that is removed. 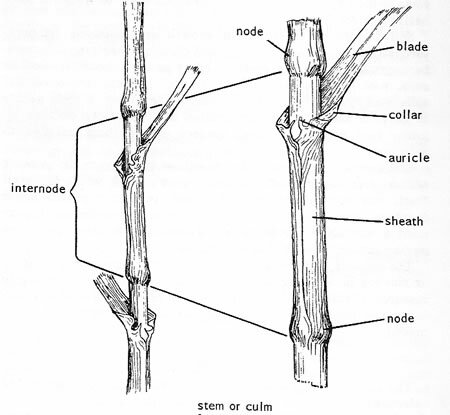 The jointed stem (culm) of a grass plant consists of nodes and internodes. The nodes (joints) are solid and usually larger than the rest of the stem. The internodes, the part of the stem between two nodes, are usually hollow. Branching at the base of the main stem may produce erect shoots; horizontal, above-ground stolons (stoloniferous) ; or horizontal, below-ground rhizomes (rhizomatous). Both rhizomes and stolons bear roots at the underside of the nodes. Some species of grasses branch only at or near the base from axillary buds at the basal nodes. Others branch and rebranch from buds produced at upper nodes, giving the appearance of a dense bouquet. Stolons are stems or runners that originate at the base of the main stem and grow along the surface of the ground. They have nodes and scales or well-developed leaves. Roots borne at the nodes help to establish and spread the plant and to produce new plants if stolons are broken. 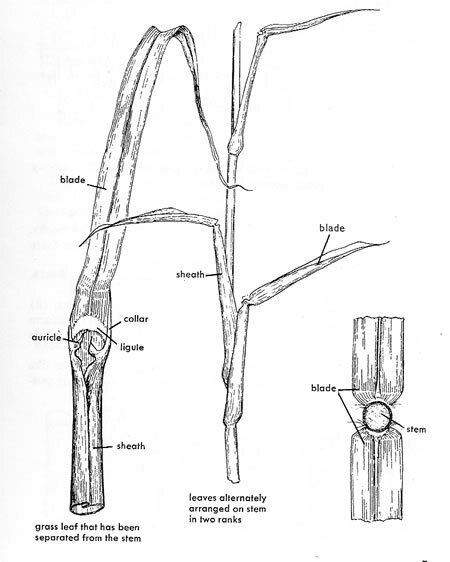 Rhizomes are stems that originate at the base of the main stem and grow horizontally below the ground surface. They have nodes, internodes, and scalelike leaves. Roots grow from the underside of the nodes; shoots (stems and leaves) grow from the topside. Stems of most perennial grasses die back to the approximate base of the stem each year. However, in the basal part of the stem, there are from several to many basal nodes with axillary buds capable of initiating new growth. Grass leaves are borne at nodes along the stem in two ranks. The newest leaf is always on the opposite side of the stem from the leaf just below it. Leaves are parallel-veined. The grass leaf consists of three principal parts: Blade, sheath, and ligule. Other parts are collar and auricle. but it may grade from one form to another. The sheath is borne at the node and surrounds the stem like a tube. It is characteristically split down one side, making it possible to separate the sheath from the stem without tearing the sheath. In some grasses, the sheath is open — the margins do not come together; in others, it is closed-the margins overlap. Some sheaths are flattened; others are rounded. 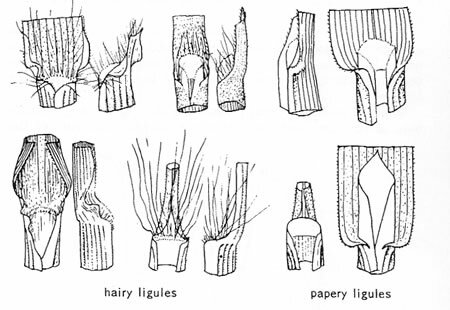 Because of their different forms and shapes, they are important in identifying a grass. The ligule, meaning little tongue, usually clasps the stem firmly on the inside of the leaf at the junction of the sheath and blade, preventing dirt and water from getting between them. In the absence of a seedhead, the ligule is often used to identify a grass. Some ligules are membranous or papery; some are only a ring of hair. The collar is on the outside of the leaf at the junction of sheath and blade. Some grasses have two earlike lobes or appendages, called auricles, which are borne, one on either side, at the base of the blade. The spikelet is the basic unit of the seedhead. It may be pediceled (on a pedicel or footstalk) or sessile (without a pedicel). 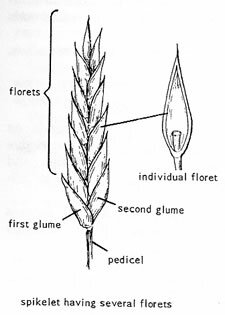 The spikelet consists of a rachilla (jointed stem or axis), one to several florets, and two glumes. The florets are borne in two ranks on the rachilla. Below them are the glumes — two bracts without flowers. Each floret consists of one flower or seed enclosed in two papery membranes called lemma and palea. The lemma is borne on the rachilla above the pair of glumes and the palea at the base of the flower or seed. 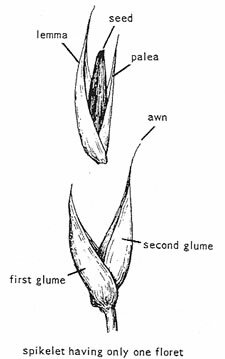 Both the glumes and lemma have nerves or veins that run from the base to the tip. If the center nerve is extended, it is called an awn. Because awns are of different lengths, shapes, and colors, they are often used to identify a particular grass. The basic forms of grass seedheads are spike, raceme, and panicle but they may grade from one form to another and may have specialized forms. Spike is a seedhead in which one or more sessile spikelets are borne on the main axis (rachis). Raceme is a seedhead in which the spikelets are borne on individual footstalks (pedicels) growing directly on the main axis (rachis). 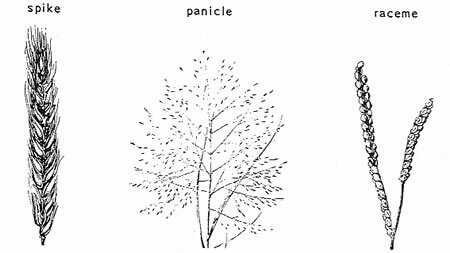 Panicle is a seedhead with a main axis and subdivided branches. It may be compact and spikelike or open.